British family living in Mijas in Malaga, South of Spain. Legal and General Advice, including information about relocating and all aspects of living, working and enjoying family life in Spain. 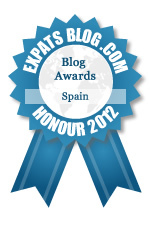 ExpatsBlog.com Expat Blog Awards 2012: Spain Honourable Mention Award! This blog won the Honourable Mention Award for best expat blog in Spain! A total 5 star blog! The author knows her Spanish Onions!Not just great reading, but an absolute MUST read for expats in Spain - really well researched and useful information for your family life in Spain! Enjoyable, witty and, more often then not, essential reading for people like me who have chosen to live in Spain. Keep up the good work! Constantly amazed at the breadth of info on this site, from what paperwork the bureaucrats will insist on, and how to get them, to places to go, and how to get there. Found some recent info there that is going to save me some money this winter! Keep it up, we need you! A blog that provides both a good read and essential information for expat families in Spain. An excellent and enjoyable resource. One of the best sites on the web about Spain. Period. .....and I say that as somebody who owns a 1200 page portal that could be considered a "competitor" to this site. If you want to know about living in Spain before, or after arrival, this blog is a fabulous resource. Every day questions are covered and what affects an expat in Spain as you live your family life here. This is an absolutely brilliant, diverse and enjoyable site. DonÂ´t move to Spain without studying it. This blog cleverly combines an amazing wealth of factual vital information with great warmth and engaging readable stuff for families, you learn such a lot without it feeling like heavy going... Living in Spain is wonderful but there are many ways you can trip up, being able to learn from the intelligent experience of others is an amazing benefit, this is one to bookmark! Excellent blog about all aspects of living in Spain, essential reading for all expats here! I was lucky to find Family Life in Spain. It has helped answer some questions I've had in a totally straightforward and logical way. It has offered me a way to understand issues that have otherwise baffled me. It's a fun site too! Looking to relocate to Spain? have a family? Your first point of call should be the Family life in Spain site. Full of useful information and insider tips. Highly recommended. A blog with an amazingly comprehensive and in-depth wealth of information on everything from paperwork to kids' activities, with personal views about living in Spain which are honest and funny. If you're moving to Spain, it's a must-read. Great, informative, fun, honest - A family life in Spain, after reading this blog who wouldn't want one ? :). Great Blog , Up to date and informative , Very helpful on all aspects of family life in Spain. A definate must for anybody living in Spain or considering moving to Spain. This blog is a great resource for information, with the kind of insider details you won't easily find elsewhere. Very helpful, interesting and well put together! Everything you need to know about moving to Spain and fun to read as well. THE best blog for expats on the Costa del Sol. All the information is 100% accurate! Even after living here 20 years I am always amazed at how quickly rules and regulations change so a quick reference back to the blog updates me as to the required paperwork, regulations, easier ways to cope, the list is endless! Great mixture of official information and real life experience that is so useful when you live here. Superb resource for anything family-related when it comes to visiting, or living in, Spain. Well written, well researched and well trusted! Very informative and entertaining at the same time, whether you're looking for useful info or just want to read on another expat's experiences in Spain. Would recommend to anyone either already here or thinking of coming to Spain. We love reading your blog, really keeps us up to speed with all that is going on, from the serious to the funny. Anyone thinking about coming to Spain or already living here, this is the one to read. This really is an excellent site with strong content indespensible for anyone thinking of relocating to Spain spiced up with guest contributions from top-notch expat bloggers. Highly recommended! For families setting out on the Great Spanish Adventure, Lisaâ€™s the ideal â€˜next-door neighbourâ€™. Learn from her experiences, get the legal lowdown, have a laugh â€“ her door is always open and the coffeeâ€™s on! Highly recommended blog for all expats to read. A great resource for keeping up to date with issues and events in Spain. Great website and really nice clean and inventive design. I only came across this site recently and must say that IÂ´m very impressed with what IÂ´ve seen and read so far. IÂ´ve lived full time in Spain for 11 years now and do think itÂ´s important to keep informed about whatÂ´s going on in the country, especially during these particularly challenging times. Thank you very much for providing such a useful service. Excellent content and bursting with information for anyone with a family thinking of relocating to Spain. Five star blog! Well done, Lisa! You have acreated an authoritative and useful blog - an invaluable tool for anyone thinking of moving to Spain. Nice website full of useful information and always up-to-date. The family is the most important institution in Spain and Family Life in Spain the most significant guide for expats relocating with their kin.